One of my favorite childhood memories was going to the feed store with Dad. There are a couple of reasons that this is one of my favorites. ~We got to ride in the truck. ~In the truck there was country music. ~We were usually dressed like farmers...jeans and mud boots. ~There were cool animals like birds to look at. ~We always got Cowtails and Dad would get a Salted Nut Roll. I don't know why Marshall Hardware reminds me of the feed store. Maybe it's because the kids always get a sucker when we go and because of that it's one of their favorite places. Or maybe it's because they toss a Tootsie Roll in your bag. Or maybe it's because they already recognize me and I feel at home there. All I can say is that as far as hardware stores go, Marshall Hardware is the best. They have everything you could possibly need. They are 100% helpful, 100% of the time. Need glass replaced in an old window? Drop it off and they'll fix it for you. They'll probably call you before you even get home to tell you that it's done. Have a stain color dilemma? Take a few cans home and try them. If you don't like them, bring them back. Marshall Hardware has never disappointed. I think the best part is that I know that my kids will have memories of going to the hardware store. Isn't it funny how it's the simple things in life that we love the most? Sometimes things turn out to be too good to be true. When all we hear about these days is horrible news and the evil deeds of human beings, it can be hard to see the good in humanity. Before you read this, ask yourself: What would you do if you found $100? Sunday was pay day for a little side thing I've been doing. I took the folded up bills and shoved them deep into my coat pocket. I wasn't even sure how much I had put in my pocket but I had a good idea. Shortly after that, as we were leaving, I sprinted through the dark parking lot at the Proctor Community Center to invite some of our friends for supper. The next morning, I remembered the cash I had put in my pocket. When I reached into my pocket, it was gone. Like so sick that I cried. I thought for sure that if it had fallen out of my pocket that it was gone forever. And if it had fallen out of my pocket, I was pretty sure that it had fallen out when I ran across the parking lot. I knew it was a long shot but I decided to call the Proctor Police Department. After telling the lady on the other end of the line what had happened and asking if anyone had turned in some cash, she put my on hold. A minute ticked by. When she got back on the line she said, "Well, you can come come and pick up your money any time today! I'm looking at it right here! Someone was honest and turned it in!" I was floored. Stunned. Ecstatic. When I got to the station (which happens to be connected to the community center and city hall) I signed for my money and asked who had turned it in. They happened to work at City Hall and the lady brought me over to thank them in person. They told me that they found my five, 20 dollar bills all over the parking lot. Loren Peterson and Tim Peterson of Proctor City Hall....Thank you is not enough. You've restored my faith in humanity. Now, what would you do if you found $100? "Do you know what beavers say? Timber! Hahahaha!" 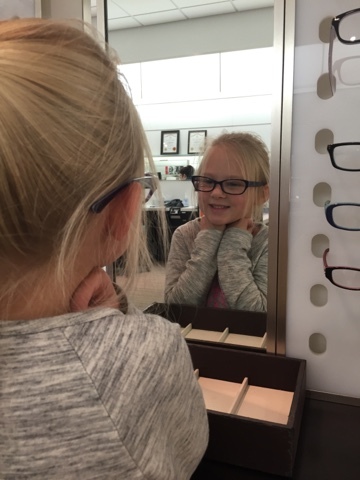 At the optometrist, Ava asked Donald, "Daddy, do you need glasses?" "Because I think you would look ridiculous in glasses." He points to his nose and says, "ose"
Oh, and I was cutting his hair today and he's got "OW!" down pat. 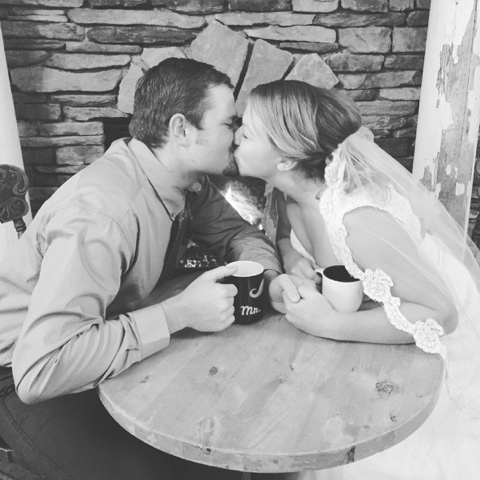 My little sister is married. And right now she's in the Dominican Republic sitting on the beach. Ava's teacher call me a few weeks ago and confirmed something that I had been suspecting for quite a while. She needed glasses. "Ava has been squinting and covering one eye to see the smartboard." Not something that any parent wants to hear....especially one who had glasses by second grade and bifocals by seventh. I made and appointment right away at Lens Crafters because you get your glasses in an hour. 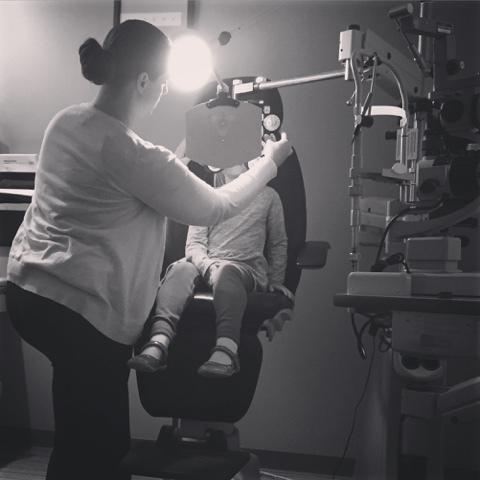 After Ava's exam, the Dr. told her that she was going to put two lenses up and asked if it helped her see better. At the moment those two little lenses moved in front of her eyes, her whole face lit up. Her expression was a look of amazement and she said, "Yeah! I can see!" She picked out a pair of purple glasses and then we shopped. I think she asked me every three minutes what time it was and if it was time to get her new glasses. 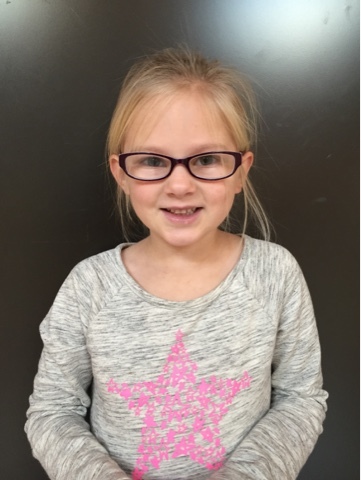 When we walked out of the store with her brand new glasses she said, "The floor looks deep!" She walked along the wall, hand over hand, amazed at how close and clear everything was. She had a little bit of an adjustment wearing them....she was shy about people seeing her with her glasses on. I'm amazed at how even her reading has changed! No wonder she pretty much failed the dot math test last month. Oscar cut all of his eye teeth in September and November. So glad we are done teething until it's time for 2 year molars! He still doesn't talk much. He says "mama" and sometime he says "no" but it sounds like "doh" and sometimes he says "more" but it sounds like "moh". He can definitely say "go!" Anger is an emotion that he's pretty good at. He's started yelling and growling when he's mad and he's learned how to hit. Sleep regression anyone? Seriously. You would think that by this age he'd be good to go but we've been having some rough nights. Sometimes he just yells in his crib and we deal with him until 10 pm. Sometimes he wake up at 2 am and he's up for hours. It's strange. Smoothie? You must sit on the floor and share it with him. He had his first sleepover away from us a couple of weeks ago at Grandma and Grandpa's. Ok....let's be honest here. It's been two weeks since I started writing this post and Oscar is now sleeping through the night again. Must have been a growth spurt. If I wrote down all of the silly things that Jaina says in a day, I'd fill a book. "To get to Grandma's house you just turn left and then go sideways!" She's usually up and ready every morning to walk to the bus stop with Ava. She's so anxious to go to school. The way that she discerns which Grandma and Grandpa we are talking about is that "Grandma and Grandpa Lund are the ones with the mosquitoes"
She's an expert at saying something and then changing her tune when you tell her no or disagree with her. Love's to read her Bible. Ava loves school. It's so amazing that all of a sudden she's started reading short little sentences. She told one of her classmates to "Find the fun in school!" My favorite time of day is when she gets off the bus and she runs home as fast as her little legs will carry her, her backpack bouncing behind her. Our biggest struggle is socks. So. Frustrating. "I just love going to bed because every day is new and fresh at school! It's just different and fresh every day!" I'm so thankful to be back in Minnesota. To actually be here for things that happen. Like breakfast with the Lund's during Kim's quick visit. Or a weekend at the cabin with Grandma Z. These are things that, for 9 years, I just heard about. But now, we are here. I don't ever want to take these little things for granted but to always make the most of every chance I get to do the things that we missed out on for so long. Now on to the weather....everyone else got snow except us.